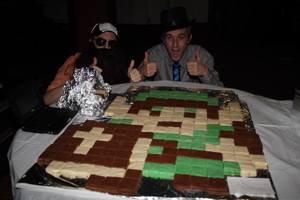 You got invited to the biggest potluck LAN party of the year and you signed up for "dessert." What do you do? 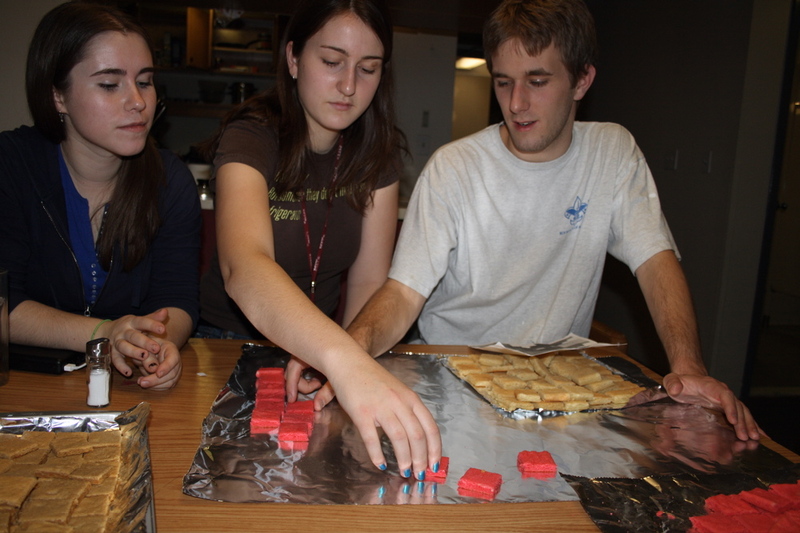 Do you try to make a Metroid jello mold? 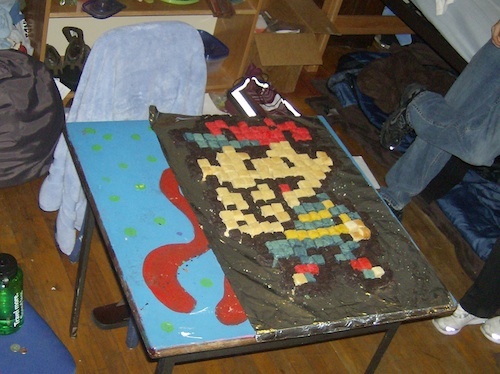 Maybe a Pac-Man cake? No my friend, you read this guide and make your very own 8-bit cookie tray! 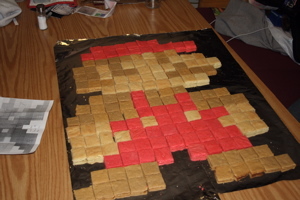 This is a great snack for your late night gaming. It's also a blast to make. So what is this now? 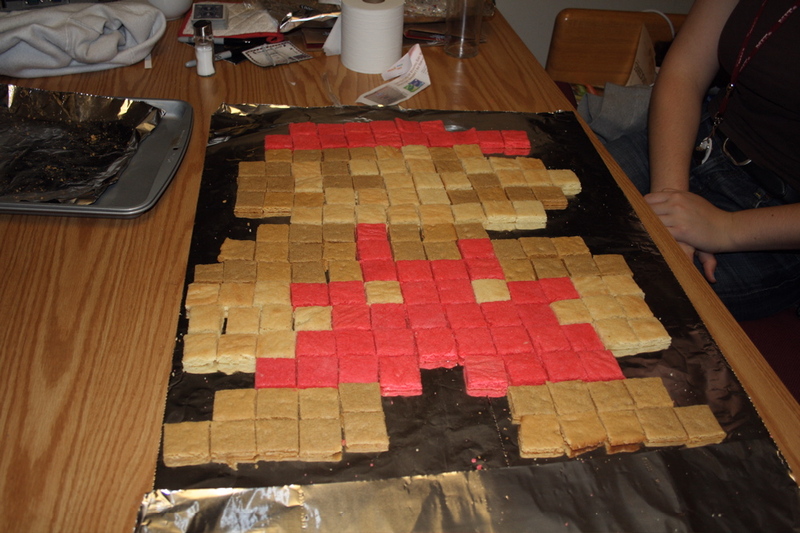 An 8-bit cookie is just a tray of square cookies that represent the pixels in a classic video game character. I chose Mario because he's awesome, and because he's only 16 pixels high and has only three colors. 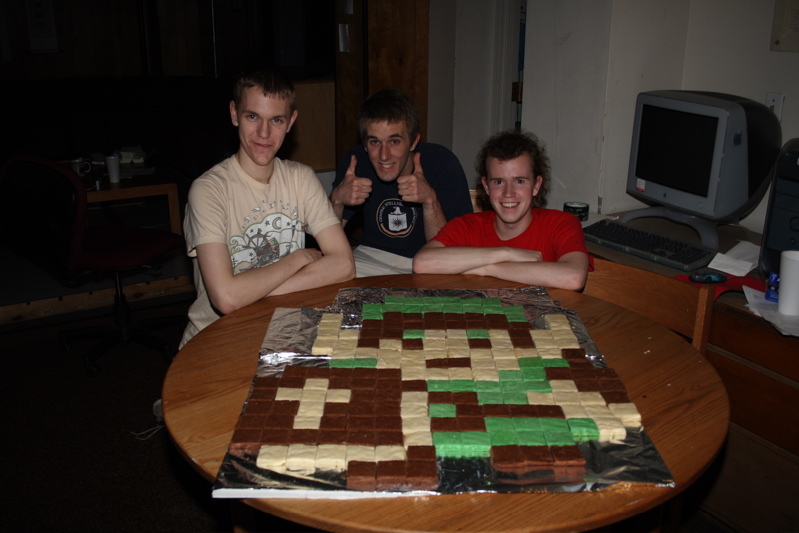 This is what the finished product will look like. Firstly, you have to get a printout of your character. The best way to do this is to just search for game "sprites." 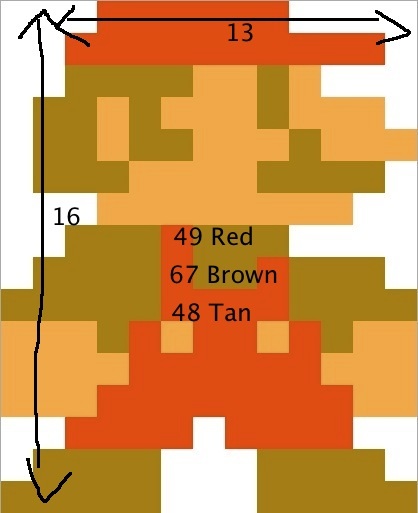 Sprites are the little pictures that represented the characters in the old 8 and 16 bit games. There is a picture for every stance a character can make (hundreds). People apparently spend a lot of time collecting sprite images. 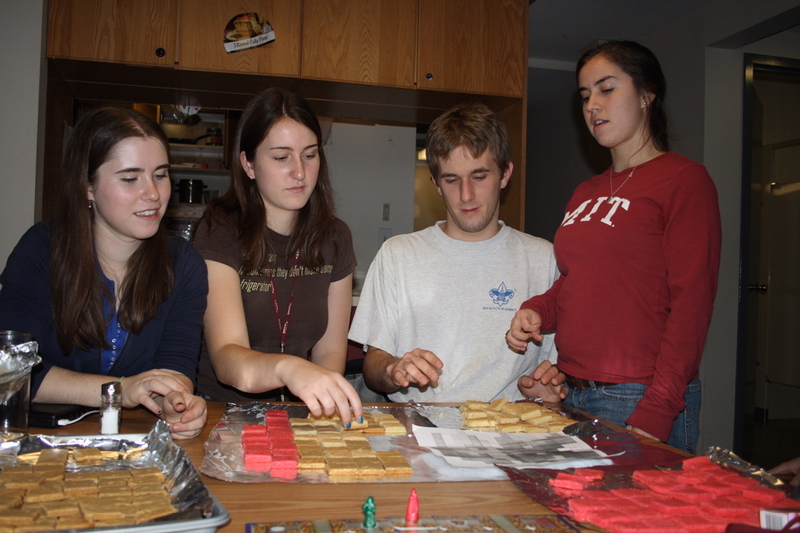 If you ask me, they should spend their time doing something more productive like making....cookies. This is the image I started with. Cute, innit? You then have to find a way to blow the image up. Most image editing programs will let you blow stuff up, but when you save it, it will compress it and ruin the whole pixelated quality of it. I ended up opening it in Seashore, blowing it up, then taking a screenshot of the blown up version. Do it however you want, but you just need a bigger picture (or a good magnifying glass). Here's the picture blown up and measured. 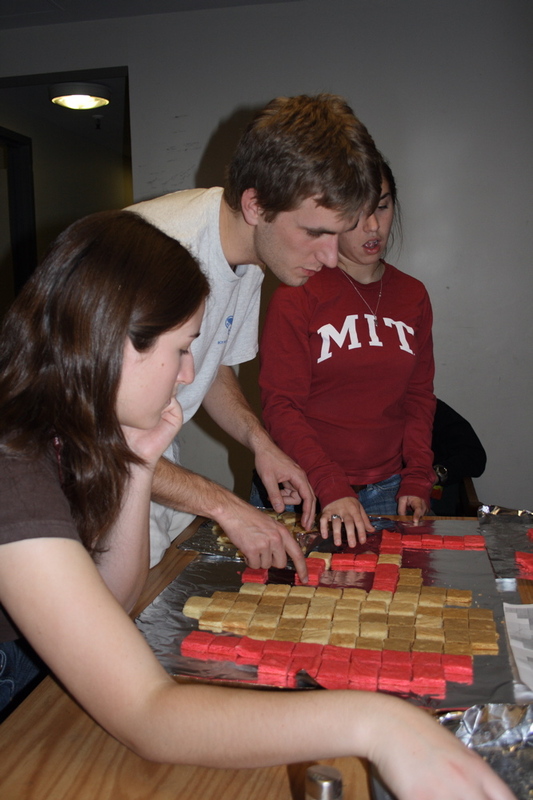 You'll need to count how many pixels of each type you need to make. This will help you estimate how much dough you're going to need. 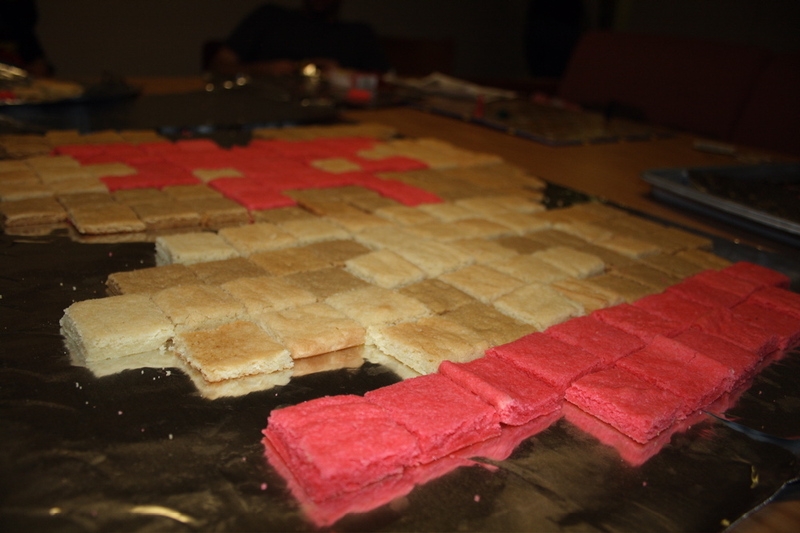 You'll also need to pick a size for the pixel cookies. I don't recommend going under a square inch. 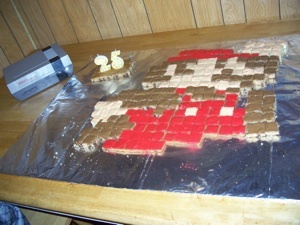 If you try to cut the cookies too small, they'll just crumble; make them too big and your Mario will be life-size. I chose 1.5" x 1.5"
As far as the dough goes, I suppose you can use anything. 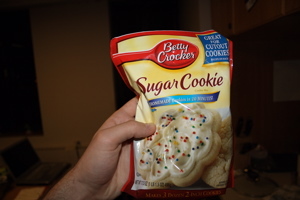 I just went to the local Star Market and got some cookie mix. The sugar cookie mix is really easy to dye, but you'll probably want to be more creative with the flavors of some of the colors. 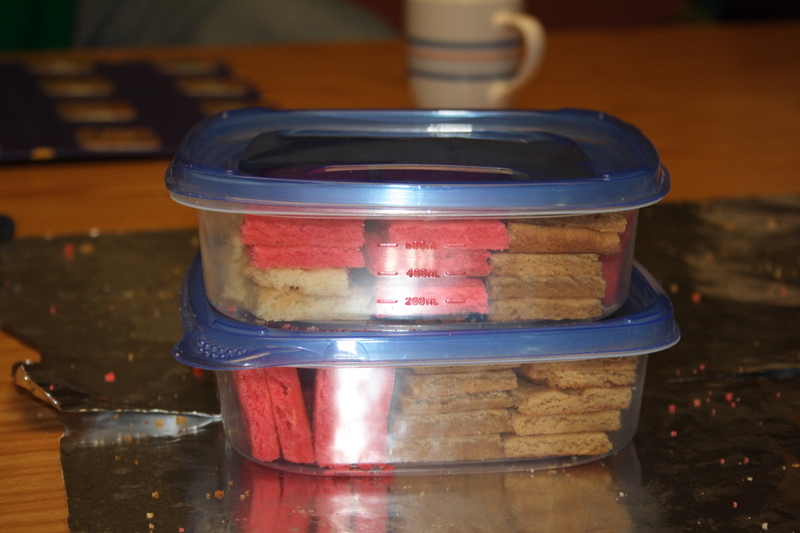 I used sugar cookie for the tan, dyed sugar cookie for the red, and peanut butter cookie for the brown. 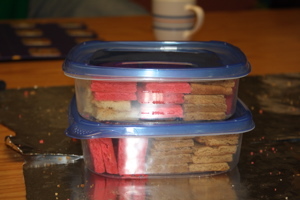 There's no set way to determine exactly how much cookie mix you'll need. Look on the back of the packaging for a recipe for a "cookie cake." 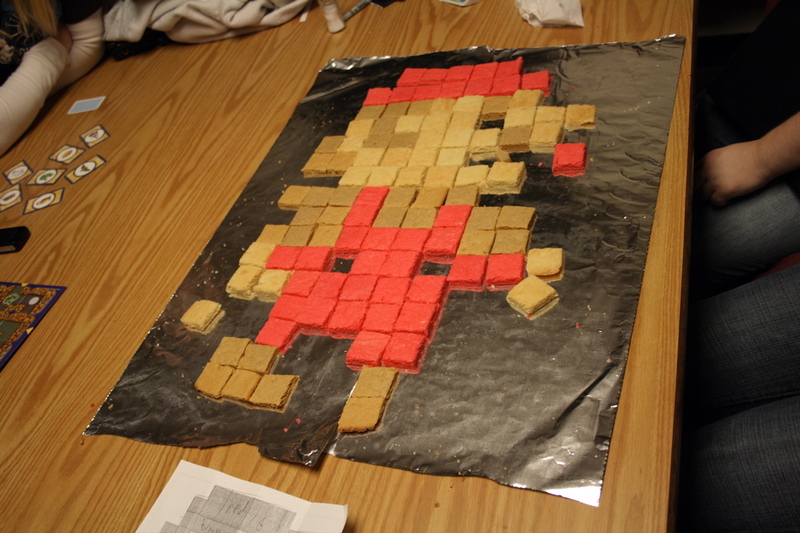 It might give you an idea of how big of a sheet the mix can make. Just add egg and butter...I guess I can handle that. 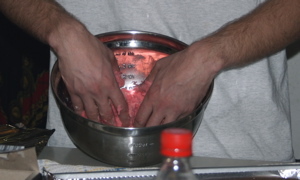 Mix the dough as directed, then spread it out on a greased cookie sheet. 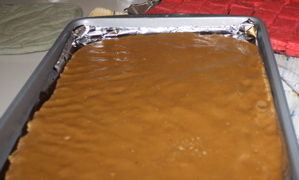 You want to spread it pretty thin and with square edges. 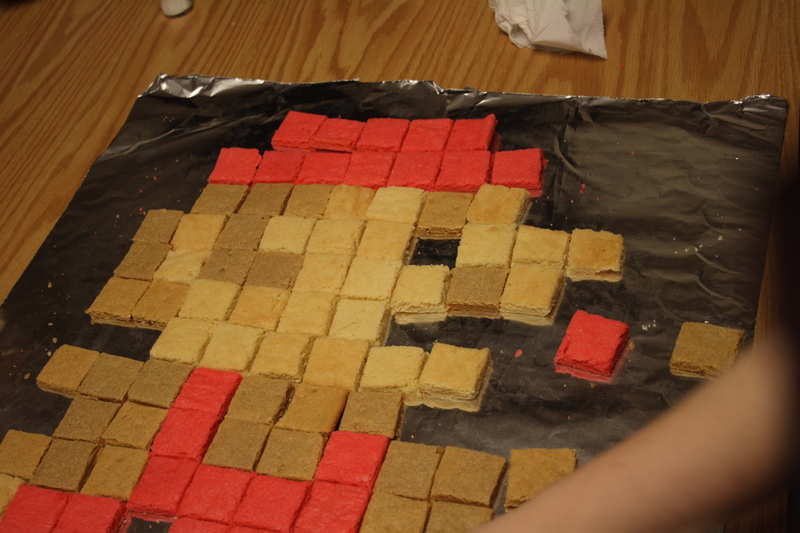 The more square your sheet of dough, the less will go to waste when you start cutting it into pixels. 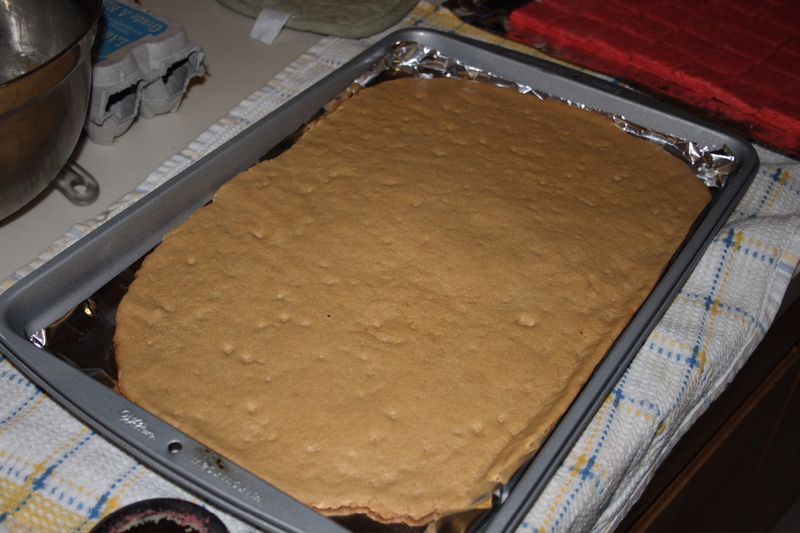 Here's the peanut butter cookie dough all spread out. 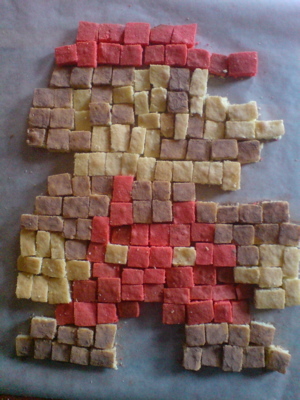 If you want to make colored pixels, you can just dye the dough with food coloring before you bake it. 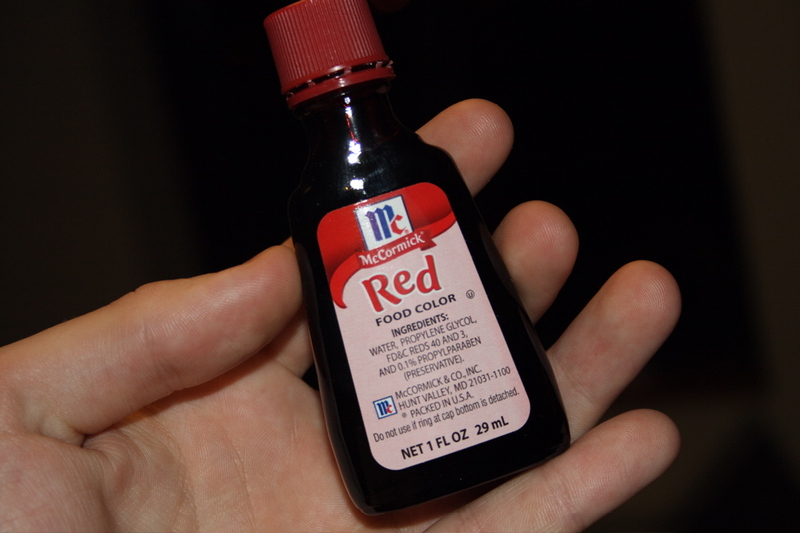 Just make sure to mix it in really well. 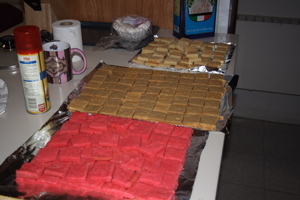 Baking isn't really a precise process. My bag said to bake at 350, for 7-8 minutes. 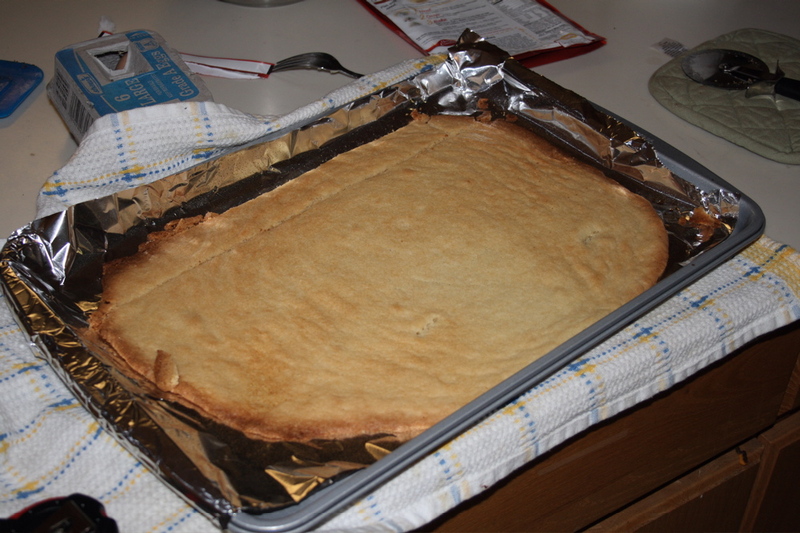 I worried that the dough would burn because it was spread so thin, so I just decided to check on it every few minutes. 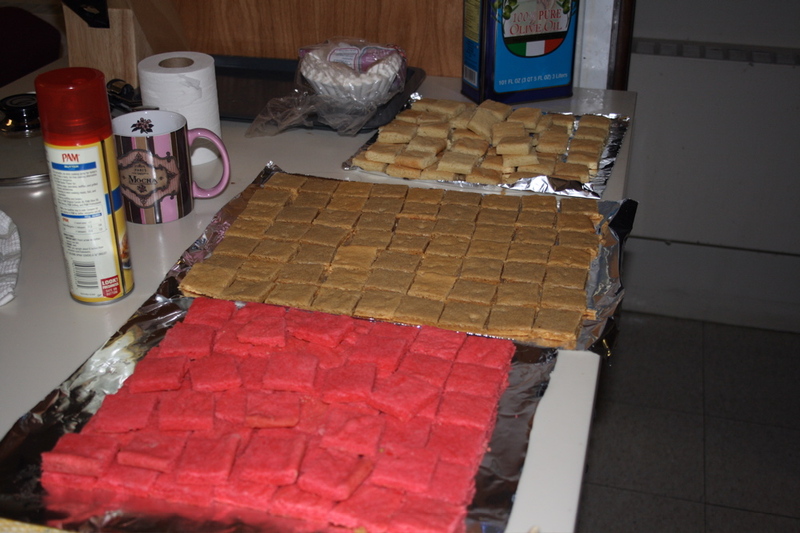 The batches all finished somewhere around 8 minutes. Here's the peanut butter sheet after baking. 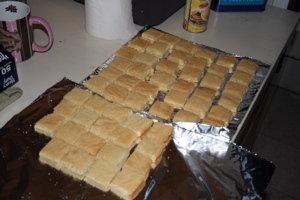 Originally, I was going to cut the dough with cookie cutters before baking. I decided this wasn't going to work because the cookies wouldn't be very square after baking. 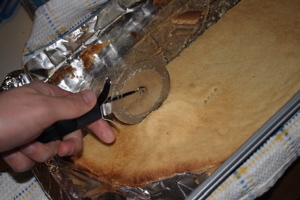 The best way to cut the dough, I found was using a pizza cutter while the dough was still warm. 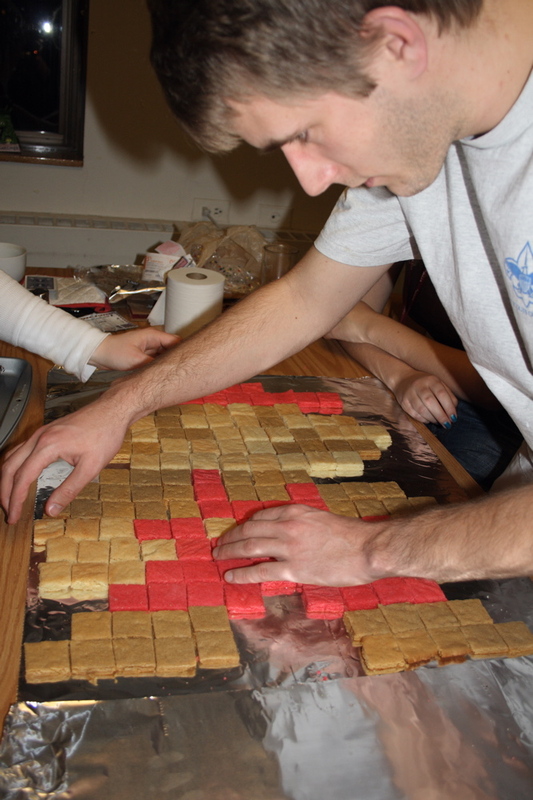 Use a tape measure to mark out 1.5" rows then cut the rows into 1.5" pieces. Here's the sugar cookie sheet that I began cutting. The pizza cutter did a surprisingly good job of cutting the cookie without crumbling it. Just repeat this process with all the other flavors and you're good to go. Once you have everything good to go, grab a few friends and start assembling. Assembly is a pretty self explanatory process, so I'll just post the pictures. I hope this doesn't hurt. Mario gives us his best Pac-Man impression. After he got his leg bitten off by a pirana plant, mario had to use a peg leg. This cookie was a blast to make. It only took about 3 hours total, and the result was beautiful. I really wasn't expecting it to work out as well as it did, but it was a pleasant surprise. 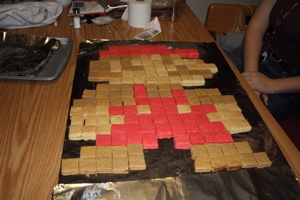 If you make your own 8-bit cookie, send in pictures, I'd love to see them and I'll put them on the site. Here's a Mario sponge cake sent in by Ethan who claims that making 8-bit snacks is "much more fun than studying." I'd have to agree. 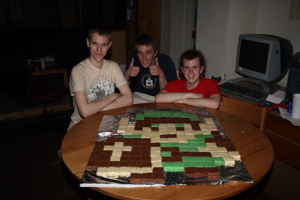 So, my dorm had a cookie bake-off and myself and two of my hall-mates decided to enter a cookie. I'll give you a hint: He comes to town. 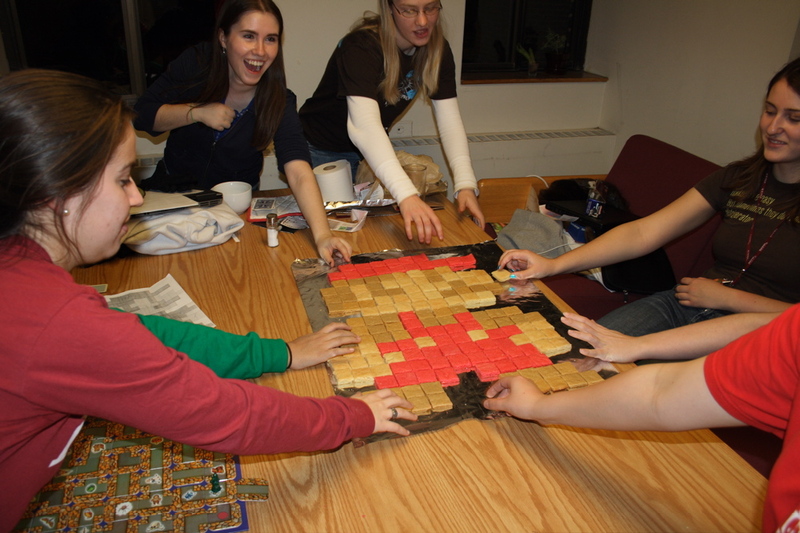 We entered this guy in a few categories including most interesting use of an unusual ingredient (pixels), most foreign (Hyrule), and most massive (30x32 inches). We ended up taking home most massive and the prize money was just enough to cover the cost of the ingredients! 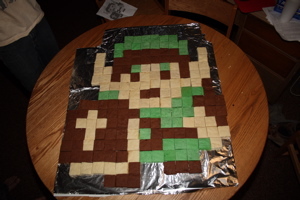 Link was a little larger than Mario. In addition to his body having more pixels, we made each pixel 2 inches instead of 1.5. The green and white were sugar cookies and the brown was chocolate (all made from scratch!). Paul in I in our finest attire for the unveiling. I found your site during a google search for Mario Cookie Cakes. I made one for my boyfriend's 25th birthday. 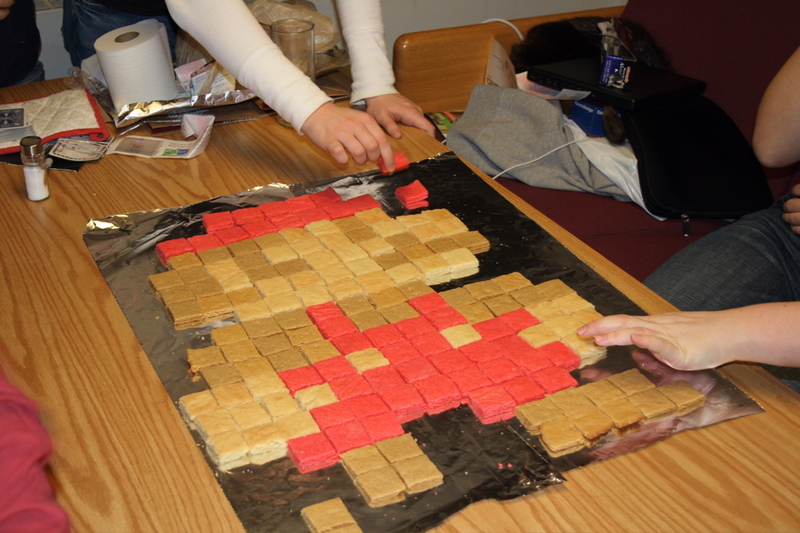 It was a 1984 themed party so we had to have Mario. I loved your idea and took it to the next level. 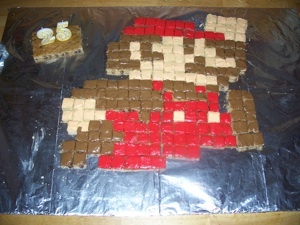 My boyfriend also wanted the jumping Mario. Hope you enjoy this, thanks for posting yours, it's a brilliant idea and was a great success!! Thanks for writing Charlet, the cookie cake looks great! 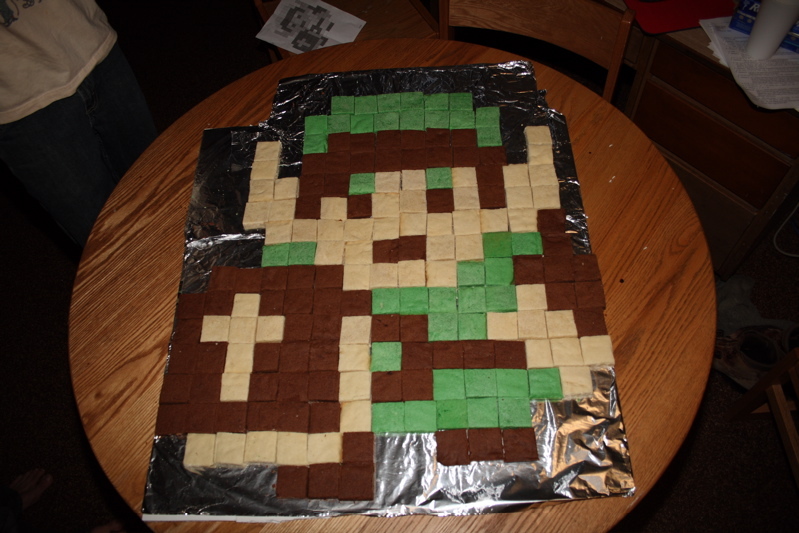 After coming across your 8-bit Mario and Link, I decided to bake a 16-bit cookie Ness with some friends for my boyfriend's birthday cake. Wow, breaking into the 16 bit era. 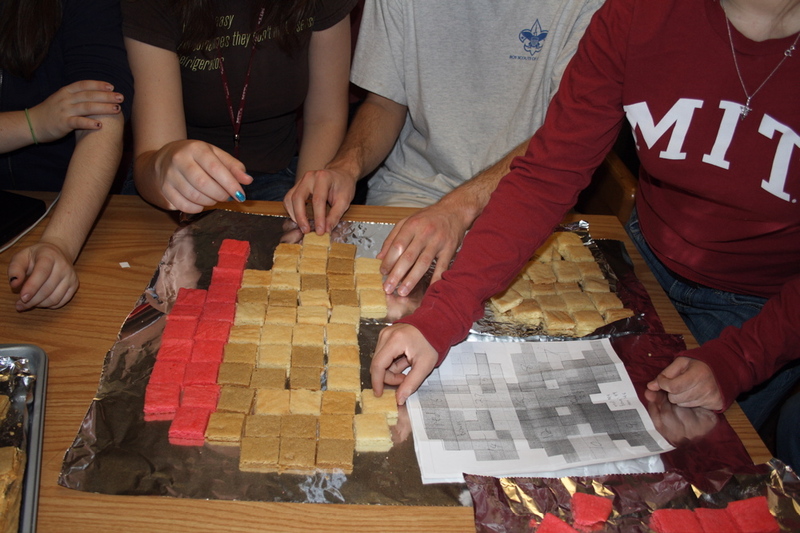 I wonder if Moore's Law applies to cookies... Very impressive!